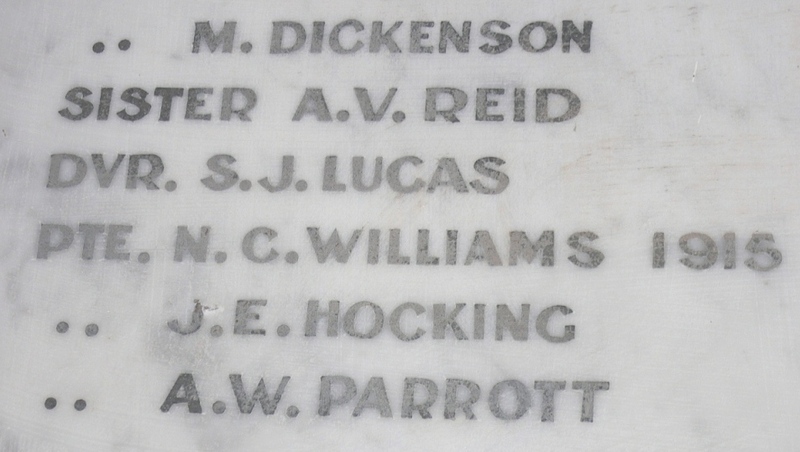 Connection to the Hunter Valley – Staff Nurse Violet Amy Reid is named on Gregson Park Memorial, Hamilton, as “Sister A V Reid”. Nurses with the rank of Staff Nurse were often referred to as “Sister” as a courtesy. Amy graduated from Newcastle Hospital in 1914. Amy and her contemporary Staff Nurse Ivy Robbins embarked for overseas service on the Mooltan in 1917. Ivy had graduated from Newcastle Hospital a year after Amy, in 1915. Perhaps they had encouraged each other to join the AANS as soon as they had the necessary two years post-graduate experience. Staff Nurse Amy Reid in the uniform of the AANS. Photo courtesy Pam Reid-Philip. Service location – Salonika and UK. Amy Reid was the daughter of my great grandfather’s brother Robert Reid. I wrote a story of her service in WW1 in the “Murrumbidgee Ancestor” in the Oct 2012 journal of the Wagga Wagga & District Family History Society. Amy finished her nursing career in Canberra. She died in Kingston ACT in July 1960, aged 75. I did not know there was a Newcastle connection. Her embarkation address was Darlinghurst. My mother was a Reid. Cheers Rob Walker.